Three people were killed instantly yesterday afternoon when their Cessna Conquest 441 crashed on take off from a small country airport north east of Adelaide in South Australia. The aircraft was on a training flight and had previously flown up from Adelaide, it was on its return sector when things went bad. Several aircraft in the area reported picking up an ELT (Electronic Locator Transmitter) activation and a search and rescue was put into place immediately. The Rossair charter plane and its 3 passengers were found by a police search crew about 2.5 klms west of the Renmark Aerodrome at 7:10pm SA time. The incident is the worst plane crash in South Australia since eight people on board a Whyalla Airlines flight were killed when it crashed into the Spencer Gulf in May 2000. My thoughts and prayers go out to the immediate families and of course the staff at Rossair. It was time to head down to the coast today on business and my first appointment wasn't until 10am so I headed to the airport for a few early morning photos before hand. As I made my way back up the coast I stopped at one of many beaches for lunch, this view is amazing and the Autumn days in Queensland are like this most of the time. A Skippers Aviation aircraft (similar to the one above) suffering engine problems made an emergency landing at Perth Airport earlier this morning. Emergency crews were called to the airport about 6.55am after reports a plane, a Dash 8 Q300, with engine problems was due to land. The plane was chartered to carry 50 mine workers to a place called Leinster, 900 klms North East of Perth. The plane departed from runway 21 at 6.35am local time and climbed to flight level 2,900 before declaring an emergency and returning to the airport, landing on runway 21 at 6.58am. The aircraft landed safely and all passengers and crew were unharmed. The registration was VH-XKI (CN 587) and it first flew on the 1st May 2002. The aircraft entered service with Air Nostrum from Spain. The months seem to fly by very quickly as it only seems like yesterday I was heading off to Sydney. My flight today was at 6.30 am so I headed to the airport arriving there around 5.30 am. I went through security, and as always, I got swabbed for explosives. Clearing security I headed to the Qantas Club for breakfast, having my usual bircher muesli and a glass of orange juice. I then started making my way to gate 22, stopping along the way for a few quick early morning photos. We began boarding our Boeing 737-838 at 6.06 am and I took my seat which was 9F. The aircraft today was VH-VXP (CN 33722) and this is the first time I have been on this aircraft since logging my flights over two years ago. I had a very large lady sitting next to me in the middle seat and although she was really nice and apologised for squashing me, I had a very uncomfortable flight down as far as seating goes. My back was hurting by the time we landed. The cabin doors were closed at 6.26 and we pushed back at 6.27 am. We taxied out for runway 19 at 6.31 and we lined up on runway 19 pretty much straight away. Due to the previous Jetstar A320 departing before us, we sat on the runway for around 2 minutes. We got airborne at 6.36 am and after take off did the usual left and right banks before setting course for Sydney. We climbed to flight Level 380 and the ride was really smooth. Flying time for today was 1 hour 18 minutes so I didn't watch a movie; I watched a few episodes of Two Broke Girls. Our track took us down over Glen Innes and east of Armidale, abeam Singleton, at 7.23 we began our descent. We banked left and headed south over flying the city of Sydney before heading out over the ocean. We tracked south for about 8 minutes before banking to the right and coming back in to land on runway 34R. We landed in Sydney at 7.58 am. A Qantas flight from Los Angeles to Melbourne has been turned around two and a half hours after take off when sparks were seen coming from an engine. 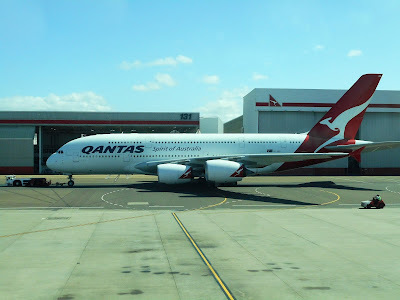 The A380, VH-OQG (CN 47) was due in Melbourne this morning at 6.55am but the pilot was forced to turn the flight around mid-air after one of four engines on board failed. The flight crew of Qantas 94 shut down the number 4 engine and initiated a turn back about 07:35 UTC, and a normal landing was carried out at 02:56 am local time. (09:56 UTC). Qantas confirmed the incident, saying pilots followed standard procedure in shutting down the engine and turning the flight around. It is understood one of the engines overheated, but did not catch fire. Loud noises may have been the sound of the engine being shut down. A replacement flight departed LAX at around 2.30pm on Saturday. The replacement flight, also in an A380 VH-OQB (CN 15), is expected to land in Melbourne about 10pm tonight. As I write this the flight is south of Nadi Fiji. One passenger, told News Limited he heard a loud noise as the engine failed. "There was an explosion from outside. We saw flames and sparks flying past the window," Mr Sudgen said. He said Qantas staff asked passengers to stay the night inside LAX as another flight could leave mid afternoon. A man was subdued after he tried to breach the cockpit of an American Airlines flight to Honolulu, a source familiar with the situation told ABC News. American Airlines said in a statement that law enforcement met the plane upon landing in Honolulu following a "disturbance" on the flight. The plane was escorted by two F-22 fighter jets for the duration of the flight following the disturbance. A source at the TSA told ABC News that the man was waiting for the bathroom near the cockpit when a flight attendant asked him to sit down. He had a laptop with him and appeared to try the cockpit door before he was subdued, the source said. The man has been detained, the Department of Homeland Security said in a statement. The DHS is continuing to monitor all flights "out of an abundance of caution," it said. Law enforcement is now responding to analyse a suspicious item associated with the man, a source told ABC News. Flight 31 from Los Angeles landed safely at 11:35 a.m. local time, according to American Airlines. All passengers are off the plane and safe, and operations at the airport have resumed as normal. A total of 181 passengers and six crew members were on board, according to the airline. The incident is under investigation. Halting of all ground movements on the airfield as the flight came in caused a 30-minute backlog, the Department of Transportation said in a statement. The DOT expected the backlog to be resolved by the end of peak travel in the afternoon. ABC News' Erin Dooley, Luis Martinez and Alex Stone contributed to this report.